I-45 will be completely shut down near downtown overnight into Tuesday morning. HOUSTON (KTRK) -- There's a major closure happening tonight on I-45 between US-59/I-69 and I-10 that could likely impact you or your loved ones who commute past downtown Houston. I-45 at the Dallas bridge is a surprise construction project for TxDOT after an 18-wheeler hit and damaged the bridge back in September. Replacing that bridge was supposed to span over four weekend closures of I-45. "We were supposed to close the bridge over this last weekend, but because of the heavy rains and the extreme weather that came in, we had to postpone and cancel that work," said Danny Perez, a Public Information Officer with TxDOT. 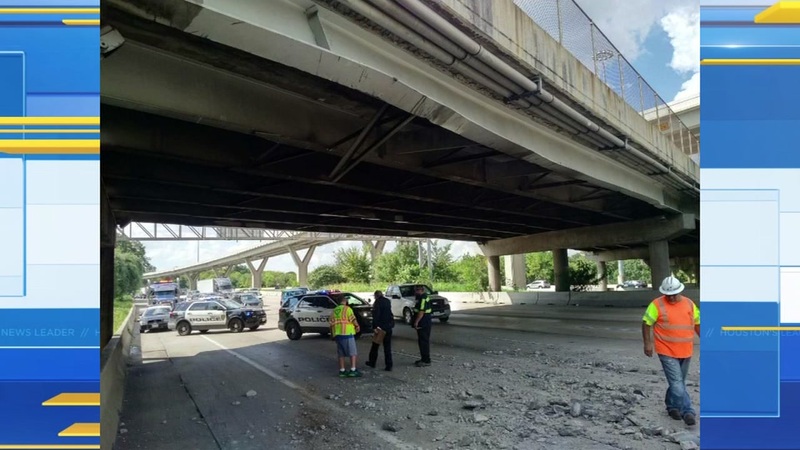 It seems like an epidemic -- oversized trucks hitting overhead bridges while traveling Houston freeways. Instead, contractors will make up the work on the Dallas bridge over I-45 tonight. "What we're doing is pouring the concrete for the bridge deck. It's a process it takes some time, and then we need time for curing, but we can't do this work with the freeway open, so for the safety of the traveling public, we're doing it with the freeway closed," explains Perez. Starting at 8:30pm tonight, all northbound and southbound lanes of I-45 between US-59/I-69 and I-10 will be closed until five o'clock tomorrow morning. Your alternate will be to take Us-59/I-10. To access downtown, take I-10, US-59 or Allen Parkway. "So, what we're doing is squeezing a weekend's worth of work into one night closure. We can get it done, but we're asking folks to be patient with us for this closure," says Perez. The last planned closure will take place this coming weekend: from 9pm Dec. 9 through 5am Dec. 12th.